Child-friendly? Anything coming from Pixar studios is understood as being made for children – however parents should be aware of the PG rating that comes with Up. While previous Pixar features were G, this is one received a higher rating due to some frightening scenes involving the main characters being chased and almost falling off of the floating house. This is also the first 3D Pixar film, which may scare younger children not used to seeing images pop out of the screen. Probably appropriate for children ages 6 and up. Apparently the animation studio that delighted your kids with a family of superheroes and talking toys has done it again, this time with a senior citizen, an obese adolescent and a house being lifted in the air with thousands of balloons. 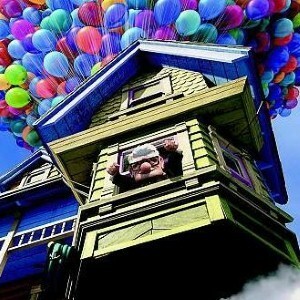 Pixar’s Up centers on widower Carl Fredricksen (Ed Asner) who embarks on an adventure by outfitting his home with balloons, allowing the house to be airlifted away. However, after the house successful takes off, Fredricksen discovers a stowaway in Russell (Justin Nagai), a young Wildlife Explorer scout working on his Wilderness Explorer badge. The pair eventually ends up in the jungles of South America where they are met by a host of exotic animals that include talking dogs (their collars interpret their barks) and a large bird that Russell names "Kevin." Soon Carl and Russell are on a mission to save some of the animals in the jungle who are being hunted. A couple of guns are fired in the process, which may scare younger children. Fathers should also know that though their kids may have seen the other nine Pixar features, Up is only the second that is rated PG, due to some scary scenes and the fact that it’s in 3D. Aside from that, the only thing fathers may have to worry about is their children thinking strapping balloons to their bike will put them in flight.